If you are a heavy user of Google Now, this fix probably is not for you because Google add many nice Google Now features in recent updates. 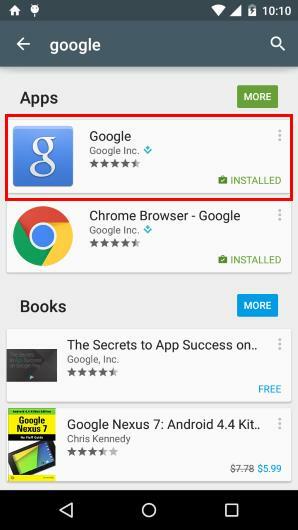 Here is the quick steps to uninstall the updates for Google app. Step 0: Verify the version of Google App in your phone. You can go to Settings–Apps. In some models, you need flick to All tab. Tap Google App as shown below. In the App info page, you should find the version of the Google app as 4.1.24.1672412.arm as shown below. 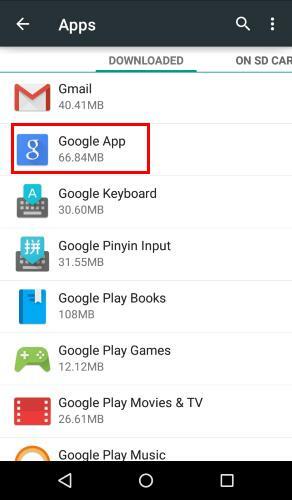 If the version of your Google App is lower, this guide will probably not work for you. The Motorola Assist not reading message issue is very likely caused by other apps or settings. As you notice, you cannot uninstall updates here. You have to go to Play store to manage the updates for this app. Step 1: Start Google Play app. 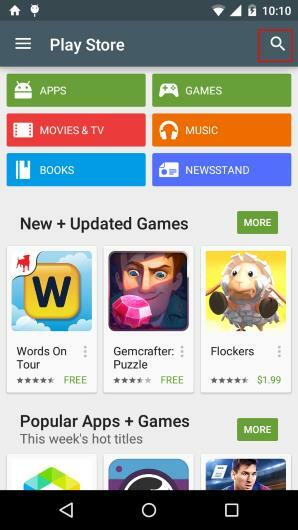 In Play Store app, tap search button as shown below. Then type Google to search for Google app. The search results will be shown as below. Step 3. Tap Google app to open the detailed info page. Tap the Google app as shown above. This will bring you to the detailed page for Google app in Play store as shown below. Step 4. Tap Uninstall as shown below. This will only uninstall the updates, not the Google app, from the phone. 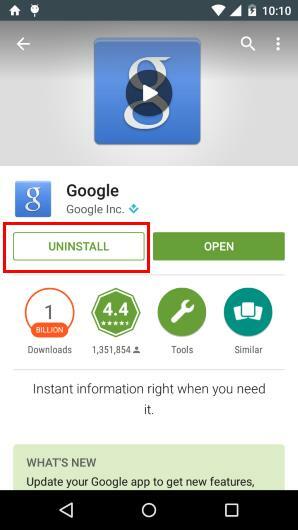 You cannot uninstall Google app from your phone actually. 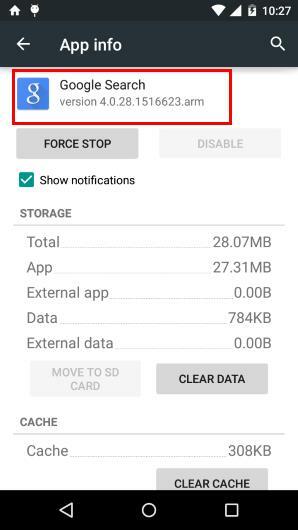 So tap Uninstall as shown below to remove the updates so that Motorola Assist can read messages or reply messages in home mode and driving mode following your voice commands. Step 5: Tap OK to acknowledge the uninstallation as shown above. As highlighted in the pop out message, this will reset the app to the original state. It may take a few mins for the phone to uninstall the updates. After the Google app updates are uninstalled, you can test the Motorola Assist message reading feature in either Home mode or driving mode. You can also check the app info for Google app which should be changed to Google Search. You can find it in Settings–Apps–All. The version should be 4.0.x. Is your Motorola Assist reading messages now? If you still have problems with Motorola Assist in Home mode or Driving mode, please let us know in the comment box below. This guides should on all Moto devices: Moto X, Moto X 2nd Gen (Moto X 2014), Moto G, Moto G 2nd Gen (Moto G 2014) and Moto E.
As of Jan 12th, 2015 I had the issue using Motorola Assist on my Motorola DROID-X when in the HOME mode not allowing the alert of “you have a new text from ____. Say listen to hear the text message” making other noises preventing me from hearing or responding to the text. I contacted Motorola Tech support (level 2). I was talked into doing a complete reset, but could not do this before backing up everything I had (I will never do this again). After the complete reset and spending hours restoring my information, reinstalling my other apps I received a notification that Google needed to update my phone. Thinking this was normal, I allowed the update on January 15th, 2015. As of doing the Google update, I experienced the same additional noise preventing me from being able to listen or reply to the Motorola Assist while in HOME mode. I telephoned Motorola again and was told that I had three options. 1. Do another factory reset; 2. give them my credit card number and they would do a phone swap, but I would still have to migrate all of my contacts, data, pictures, etc from one phone to the other, but was warned that Motorola Assist still may not work because I may be transferring the glitch from the old phone to the new phone; and 3. I could send them my phone and they would send me a new one requiring me to do a cloud restoration of my information, but I would be without a phone for up to 2 weeks. I asked if I were to go into my Verizon corporate store would Motorola waive the credit card hold and I was told “NO”. I explained to the Motorola rep that I would be going to the Verizon store, give the reference numbers that I was provided by Motorola and persuade Verizon to allow me to dump Motorola and get a Samsung phone. The Motorola rep was then more happy to try to accommodate my inquiry of how to fix this Motorola Assist problem. While being on hold for 10 minutes I found your site and followed the UNINSTALL Google instructions where it stated that this does not uninstall Google, only the updates. Thank you for saving my a trip and an argument with Verizon and the time I would have to spend transferring my information from one phone to another. I have done above steps on my Moto X Gen1. However with moto assist home mode when I receive a call, prompt says “answer or igonre”. And immediately the prompt says ” Sorry I am having network trouble , let’s talk later”. This prompt also received for message received in home mode. Also, my network is showing four sticks. Is it a app issue or network carrier issue? do you have internet connection when you see get this message? Ok got it, my internet connection was slow when the message received in moto assist home mode. It is working now…Thank you!!! 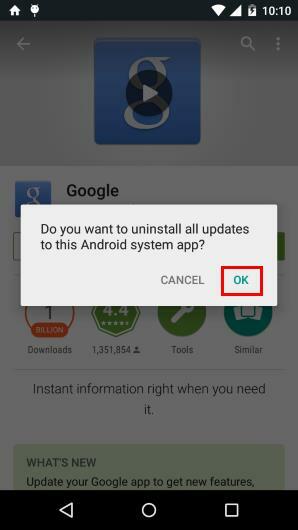 I have tried the tips of Uninstallinh Google App from Play Store. Powering down….clearing cache and data. No luck. This is the feature I brag about to all and friends with other phones try to get a app like it but with no luck. Did you check the Google Search version? Your phone probably automatically update the app. You need turn off auto app update. Actually, after uninstalling the update, it is not necessary to clear cache or clear data. Reboot is need only when you update the Google app. Not sure what you mean by Google Search version. I would just like my Assist back!?! There are some conflicts between the recent updates in Google app and motorola Assist app. You have to wait either Google or motorola to fix them . Before the update is available, the temporary workaround is to uninstall the Google app update. Thank you!! This worked for me. I use Assist more than I use the Google features. This seemed to happen when I updated Google Hangouts. Assist was working fine before the Hangouts update. I tried uninstalling Hangouts latest version, but that didn’t help. I think I’m experiencing what is being described above…when getting a new SMS text message, Assist says “new text from ______, to hear it say listen” then a bunch of weird noises that doesn’t stop. I can’t say listen, can’t cancel either. In any case, if I uninstall the latest Google App, is that going to affect the way other Google apps work? Basically, are there going to be other issues by “backdating” the Google App? Thanks! Glad I found this I thought my phone was messed up. It will affect some features in “OK Google” detection and a few Google Now features. It should not affect other Google apps, as i know. Anyway, you can always update at anytime when needed. Please reboot the phone after updating it. Thanks, worked for me! 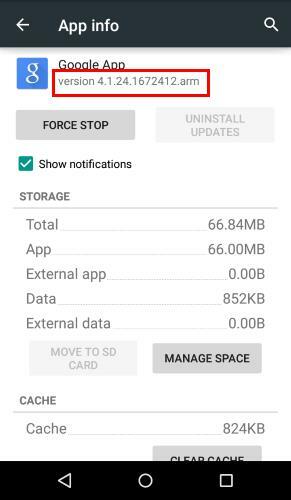 How will we know it is safe to install the Google App updates? I guess Motorola will update the Motorola Assist app to solve the issue. But it may take a few weeks. We will update this post for any news on this issue accordingly. These steps fixed my wife’s Moto X, she was threatening to go buy a new phone as she thought this one had gone bad. And I am no longer sleeping on the couch for buying her a crappy phone. Thank you so much for this thread, the issue was driving me crazy. It works with the Google uninstall of updates. If any one finds a new update version that we can install please post here! This worked perfectly. Thank you!! I’ve been weeks trying to figure out what went wrong. Worked excelent ! Thank u !! I had no idea this was a problem with all Assist users until today–I was going to throw out my Bluetooth device because I thought that was the cause! The Assist update just showed up today. I hope this gets everything back to normal. Hands-free messaging is why I bought a Moto X in the first place. On a 1st gen Moto X Dev edition this patch works. As of 1.25.15 this patch is no longer needed. Motorola Assist has been updated. Update: Motorola just updated Motorola Assist app. 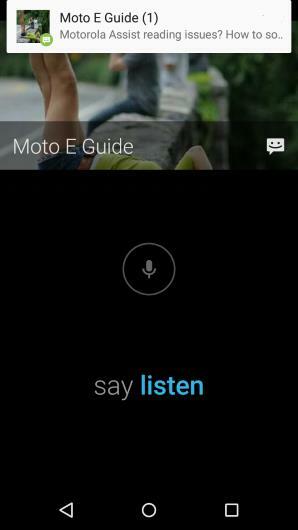 The problem that Motorola Assist refuses to read messages or respond to voice commands is solved in this update. Please try to update the Motorola Assist app from Play Store. Hi: I’m a new Moto X 2014 user and also have the Voice problem. I don’t see a new version of Moto Assist on the Play store, however. Google just out a Feb. 6 update for the “Google” app update, should I update this now? I have the Moto X 2014. Motorola already fix the issue in Motorola Assist app. it should work with new Google apps now. So, you can update the Google app if you already updated Motorola Assist. There is no Moto assist for the 2014 X as a stand alone app, the play store says it is “not compatible for this version”. Installed the Google update and now my home and driving notifications stopped working again. Going to uninstall the Google app update again. Motorola, please fix this! Can someone help? I have Motorola g 4g. I cannot get my phone to understand me when I say ‘listen’ when a message comes in. If not that it doesn’t always register that I am home even though it knows where I live. What’s the response from the phone? Did it say it cannot catch you? For the home mode, it is very likely due to GPS error. You can always check the current address based on your GPS. If the error is consistent, you may change your home address to this address. This will NOT change your Google settings. I have the same issue whenever I am driving. Drives me nuts. It won’t recognize me or my commands. Only once and a while. I use a Motorola Droid Mini. Next time, you can check whether the phone does not hear you or it cannot understand the command. Your trick of uninstall google update work for my moto g 2nd gen !! Thanks Simon. Hi Simon and thanks for having a forum for this issue that appears to be problematic to a lot of us Moto X (2013) owners. My question is: does assist work in the car when you are playing radio or cd versus using a streaming music service (spotify)? I am getting it to read texts to me when I am using streaming music but nothing when cd or radio. Is this normal or as intended? It depends on the car entertainment system. For most cars, this is normal. HI Sujit here after i did the above things i am getting the issue.its saying can’t troublemaker i am having some trouble,net work issue. The bug was fixed long time ago. Probably the the location got from GPS and map is not the home address. Sometimes, in some regions, the error can be large. You can check the current location reported. Is driving mode available on Moto E 2nd Gen (Moto E 2015) ? I haven’t been able to add it or get it to work. The Moto Assist help files no longer mention the Driving mode. My wife has a Moto G 2nd Gen that sill has Driving mode. Likely because she hasn’t upgraded anything. Driving assist (Home assist as well) is NOT available in Moto E 2nd Gen currently. But very likely, it will be added in future update. Update all apps. There are no known problems for Motorola assist currently. Update all apps??? Exactly what does ALL MEAN????? I have the same problem with moto g 1st gen lollipop. The latest version of the app has no known issues as you mentioned. The app can also be affected by other apps, especially Google App and Google play services. So, it is better to update all apps to the latest version.